On March 19, Rep. Devin Nunes (R-CA) filed a lawsuit against Twitter and three specific users, claiming that the site has censored him and allowed him to be the target of defamation. The Washington Post called the lawsuit's merits "questionable at best," but Fox hosts and contributors covered the lawsuit credulously, suggesting or even outright agreeing that Twitter tries to censor conservative accounts. In the $250 million suit, Nunes argues that Twitter is routinely “shadow-banning conservatives” on its platform by allowing them to post but not letting other users see or interact with the content. Twitter denies that it shadow bans accounts, and CEO Jack Dorsey told Congress last year that the company has not found any evidence of a difference in the reach of tweets from conservative and liberal accounts. Following similar allegations of shadow banning last summer, The New York Times also found no evidence that Twitter engaged in the practice. The legal merits of the case appear highly questionable at best. The standard for defamation of a public figure such as Nunes is much higher than for an average person. One expert The Washington Post talked to cited the landmark Supreme Court case in which Jerry Falwell sued Hustler magazine for a satirical advertisement in which his likeness was engaged in sexual activity with his mother in an outhouse. The court ruled that public figures aren’t protected from “patently offensive speech” if the statements couldn’t be understood as actual facts. So feel free to chuckle about the spectacle of Devin Nunes suing “Devin Nunes’ cow” — especially given Nunes’s past opposition to “frivolous lawsuits” — but know that this most likely isn’t about his purported cow or what it said. Nunes is telegraphing an expansive effort to go after people who hurt Republicans with their public discourse. Its potential impact, not so much legally as from personal behavioral standpoint, shouldn’t be so casually dismissed. 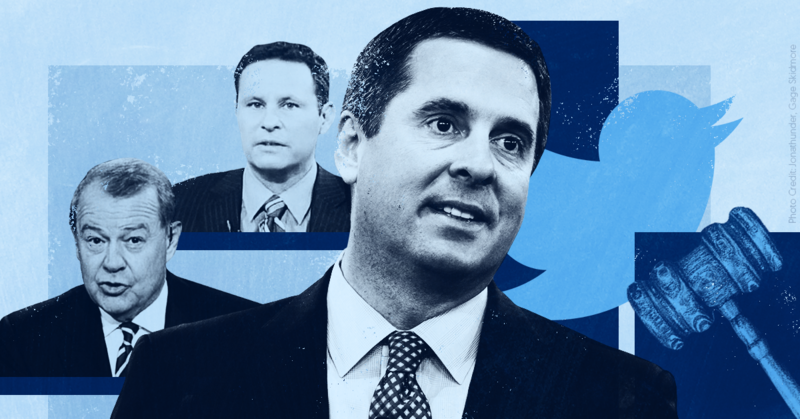 Fox hosts and contributors took a different approach than others in the media, choosing to take Nunes at his word and cheering on the lawsuit. After news of Nunes’ suit broke, Fox’s Sean Hannity hosted the congressman on his show and allowed him to rant about Twitter’s alleged political bias and supposed censorship.